Listening to songs is one of the best ways to keep ourselves in a cheerful mood. The musicians work day and night to compile the lyrics and direct the singer to sing in the right tone. It requires tremendous effort to become to become a great singer. Similarly, proper coordination of instruments is required to support the singer. A song is incomplete without background music. In most of the cases, a song won’t become popular if the music or lyrics isn’t great. The lyrics of your favorite song is either written by the singer or a professional lyricist. Singers don’t have to by heart them. Smule is the best Karaoke app on the app stores as it has registered the most number of downloads. The app is large. Its installer package size is 39 megabytes. 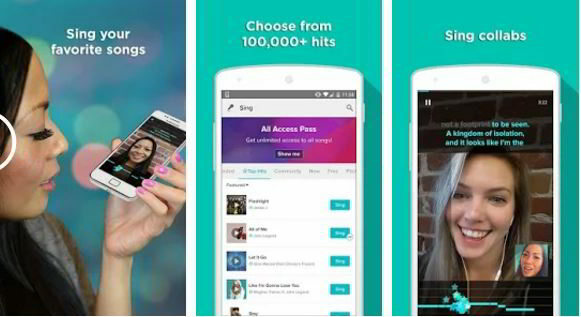 Smule gives you access to its collection of Karaoke tracks only when you log into the app. It lets users sign in with an FB, and Google account. Once the user signs in, Smule Sing asks users to select the four categories of songs they’d like to sing. The app supports local and English songs. Once you select categories, tap the next button. Now, tap on the listen button beside the song name. When you do so, the application will begin playing the song and at the same time, it will display the lyrics. You can pause the recording anytime. Yokee is one of the best Karaoke apps on the app stores right now. It is available for Android and IOS devices. When you run Yokee, you’ll see an option to create an account (Account registration is optional). Once you enter the main screen, you’ll find a list of tracks categorized in songbook interface. The app supports the following genres of music. To get started with Yokee, select the track from the list and start singing. You can sing songs in any language of your choice. 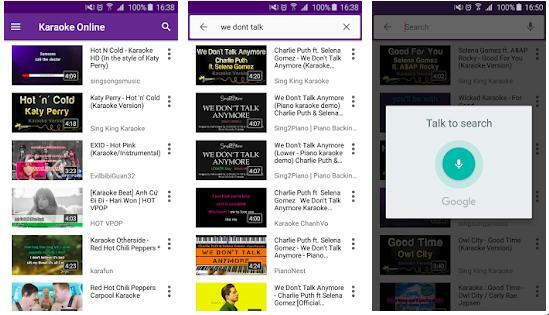 Yokee lets you record songs that you’re singing. It allows users to share recorded tracks with friends on social networks. KO is a top-rated app that displays a list of YoutTube music videos with or without lyrics on the phone’s screen. As the app displays thumbnails instead of title, it is easy to find songs with lyrics in it. Karaoke Online doesn’t have a built-in video player. It plays videos on YouTube. To make sure that KO is not consuming a large amount of data, you should change the video quality immediately after tapping the play option. When the app begins playing the video, you’ll find a “Record” button to the bottom of the screen. Tap this button to make the application record your singing. KO offers a search option. It is a tiny app (APK size is around 5MB). 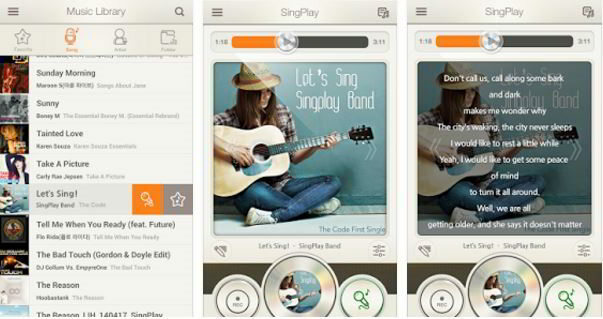 SingPlay is the only app on our list that lets you use MP3 files stored on the phone as a source of karaoke music. The application strips the voice of artists from the MP3. Then, it plays background music. SingPlay doesn’t show lyrics of the song unless you manually enter it by tapping on the edit icon. It shows the list of the MP3 songs that you’ve saved on the storage memory. SingPlay can process any song. It can record your voice along with background music. The app lets you change the pitch of the music. It has original mode through which you can listen to the original song. 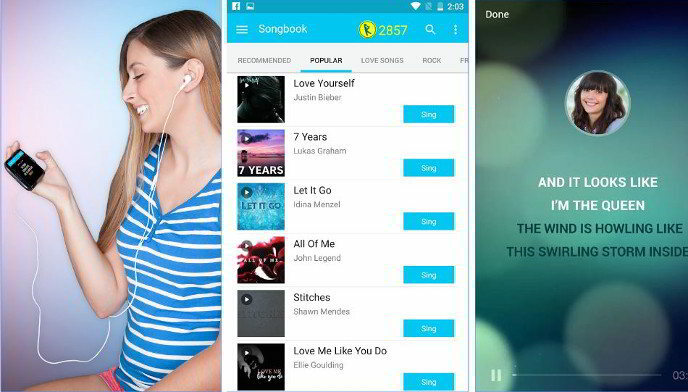 MagicSing is an app that has a user base of 1 million and a collection of over 200K songs. When you run it, you’ll see a list of songs. MS lets users search tacks by voice and text. It allows you to filter songs by category. The app provides music notes feature. It supports screen mirroring and allows users to edit the background effects of the song. MagicSing displays lyrics on the phone screen. It is compatible with MagicSing consoles. MS doesn’t support offline mode. Its free version lets you sing just two tracks every day. Its size is around 66 megabytes. 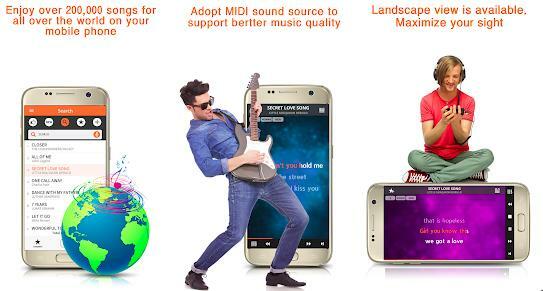 Conclusion: You can turn your phone and tablet into a powerful karaoke machine with the free apps we’ve mentioned above. The applications have great features. They have an easy to use interface.